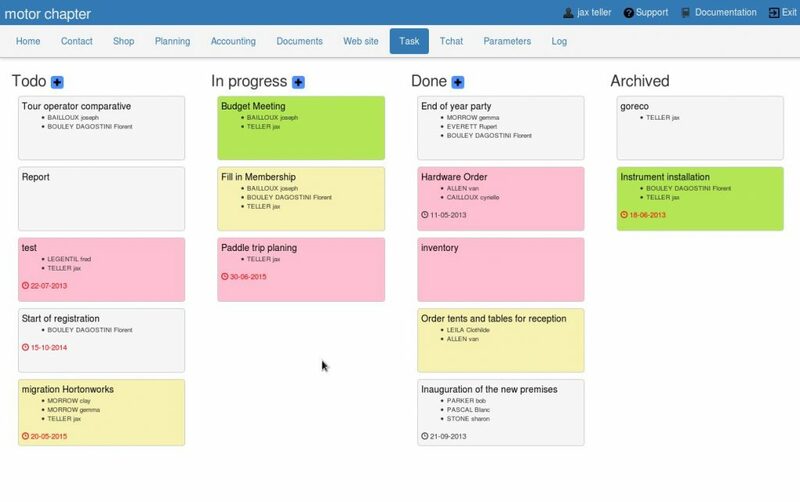 A kanban board is a tool for applying the kanban method to a workflow. Thanks to this table, the various participants in your organization can share and track tasks progress . The principle of this tool is to add tasks like post-it in columns named “to do”, ” in progress ” and ” completed “. Tasks can be moved at any time in another column to indicate their progress. When a task is completed, it finished her life in the “finished column” then “archived column” if you want to keep a history . The life cycle of a task is : create it using “to do” , then change its status to “current” and finally “finished”. At any time, the others members of your organization will use this board , it is important to make it evolve in real time. This cycle is of course not mandatory , you can adapt to your particular organization. To move a task, click on it without releasing the button and drag it into another column. To edit a task, click on its title . When you switch to edit mode, you can assign one or more persons to a task, they are the ones that contribute to its realization. If the task must be completed before a certain date, you can specify an end date of realization. You also have the option to choose the color of the task to make out such a most important task on the board. These colors can also be used to bring together families of tasks . To consult the history of the changes of the kanban board, use the “journal” tab of the Task menu , all actions and all responsible are listed.